The “IPCC Expert Meeting on the 2006 IPCC Guidelines and Software” was the workshop collaboration between CCROM SEAP and Task Force on National Greenhouse Gas Inventory (TFI) - Institute for Global Environmental Strategies (IGES) funded by the World Meteorological Organization (WMO). 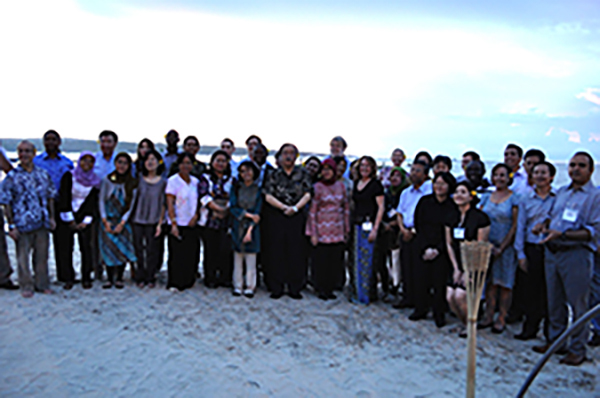 The workshop was held in Melia Benoa Hotel, Bali, Indonesia, 12 – 14 December 2012, attended by forty-five participants from various country such as USA, Algeria, Greece, Moldova, China, Russia, Japan, South Africa, Indonesia, Bangladesh, Thailand, Bulgaria, Cambodia, Lao PDR, Macedonia, Myanmar, Philippines, Malawi, and also representative from international organization such as FAO, UNEP, and UNFCCC. Objective of this workshop is to facilitate inventory compilers going beyond the 1996 Guidelines and Software, specifically to encourage the use of the 2006 Guidelines and new IPCC inventory software. In this workshop, participants will be encouraged providing feedback on the software and associated material, and on issues in the use of the guidelines..
On the first day of the IPCC Expert Meeting, participants were given orientation and overview of the whole program, overview the use of software, scope and limits of inventories, and data collection. On the second day of the meeting had two separate parallel groups who will have a practice on the use of the software. Simon Eggleston moderated the first group on “Energy, IPPU and Waste”. Nalin Srivastava moderated the second group on “AFOLU”. Both groups will review the methods used and work through examples, provide hands on training of the software, provide time for discussions, Q&A, consider potential issues for consideration by the TFI, consider potential improvements or developments of the software. On the last day of the meeting, in the morning there still a group parallel session. After lunch, they moved into plenary room to reports what they have got from the practices, discussion of issues raised and identification of potential software improvements/developments.